Will users work for content and like it? 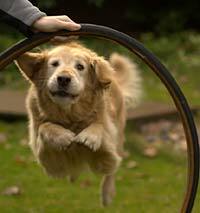 Would making users jump through a few hoops make your content more valuable and more viewed? And I’ve had this idea floating around for a while now: What about a Flash graphic that makes you play a small game or answer some questions, and then rewards you with content? Might that be better in some cases than just throwing all the content at them from the get-go like everyone does now? Think about video games for a second. Many players will spend an extra half-hour playing a game just so they can watch a new cutscene. And what do you get when you “beat the game?” More cool content. It’s worth considering. Any thoughts on why this is totally stupid or just the neatest idea? 7 Responses to "Will users work for content and like it?" The concept is certainly worth trying, but there are questions. Will subscribers find the content so compelling that they will stick with you once their free subscription runs out? Will they not bother when they can get the content elsewhere? Who’s going to develop these great games? Why the marketing department will make the games, of course! What else do we keep ’em around for? As usual, some great comments, Bryan. Seriously though, I’m sure there all sorts of consumer behavior specialists out there who’d have a much more educated perspective than I as far as whether such methods would result in more subscribers. Perhaps this would only work with services that are currently being offered for free in order to give them a greater sense of value. But as far as Flash packages are concerned, I honestly rarely click through all –or even half– of most Flash packages I come across. Why is that? Because all the links generally look the same, and I just don’t have the time. There’s nothing really luring me to click on one link over the other. Usually the links say something boring like “PHOTOS” or “VIDEO” (and I’m not saying I haven’t made many packages like these). That’s not terribly persuasive. But what about a Flash graphic that doesn’t let you just roam all over the place? Instead, you’re rewarded with more and more interesting content as you engage the graphic. Isn’t this how one would read a story anyway? Definitely a concern re: insecurity. Our home pages are overloaded with links already, and multimedia packages are hard to find on many sites. I don’t think we’ve gotten to the point yet where most sites really play up their multimedia content. Perhaps it would even be worthwhile to create a whole separate subdomain that would feature just multimedia packages, like the mercurynewsphoto blog does. Also, I was reading today about JPG magazine, and how they use the web audience to vote on the photos that appear in the mag. Perhaps some sort of rating system would be a way to get users more engaged. Lots to think about here, and thanks for bringing it up Danny. If someone has to complete a test before being allowed to sign up for text alerts, does it makes them want the alerts? Not so sure about that. Making a service harder to receive doesn’t necessarily make it more desirable. But making a service more exclusive does make it more desirable. People love to be in exclusive clubs. Think fraternities, club houses and honor societies. We love to be smarter or cooler than other people. The question is, what club do newspapers have to offer? Perhaps we could just start one: A club for news junkies. Only those who can complete the weekly news junky test with a high score can stay in the club. The longer you’re a certified junky, the higher your rank. I don’t know. You might be onto something. There is certainly a risk associated with making content harder to reach. Forced registration is the usual culprit, and it causes viewership to plummet. But what if the “registration” itself is fun or interesting, like a news quiz? That IS a cool idea about having “ranks” and a “club.” It’s the same system under which Wikipedia operates, really. People who help maintain the site get what amount to Boy Scout merit badges, recognition and a constant tally of how many edits they make. I could really see something like this working for user-generated content. In books and research reports about “interactive storytelling,” there is always a lot of discussion about game (or puzzle) vs. story. The consensus: They can be combined, but not exactly integrated. That is, the elements that make a good story tend to decrease the best elements of gameplay, and the elements that make a good game tend to decrease the best elements of good storytelling. You can combine elements from stories and games, but you’re never going to have a great game that is also a great story, or vice versa. I’m reminded of one of the worst somputer games I ever bought — The X-Files Game. Great story (on TV, that is). Awful game. And why? Too much story in it! I was hoping you’d weigh in on the Flash question! I was wondering what research reports analyze this gaming question further; I’d love to read through them. Certainly some game developers overdo the story to the detriment of the gaming. The second installment of Metal Gear for the PlayStation 2 comes to mind. Yet, I’m reminded of Myst, a 1993 game that was actually built using software similar to PowerPoint (the Macintosh’s Hypercard). The popular series revolved around a set of difficult puzzles integrated into the environment that propelled the story forward. I’d argue that the information contained in many of today’s infographics are better conveyed by gaming elements rather than storytelling elements, like in Myst. Let’s take a package on how to rescue animals in an oil spill. How about a Flash package that has a “game” in which you learn how rescuers go about saving the animals. That would be much better than the adaptation of a graphic that ran in the paper that one clicks through. But yes, it is MUCH more work. This certainly applies more to enterprise stories than to situations in which one has a day to a week to produce the piece.